A new Samsung handset has surfaced that is showing some mighty impressive specs that have more than received my attention. Details are scant regarding this handset but we do have a pretty full hardware specs sheet that should make more than a few of you excited to see this phone in the flesh. Between hearing LTE and the HD display I want it already, see below for the full details. We are hearing some of these details came from a NenaMark result seen a few months back but the photo above reveals the rest of the specs. This sounds impressive to say the least. We have an unknown Samsung smartphone powered by Android 2.3 Gingerbread that is rocking a 1.5 Ghz dual-core Qualcomm processor, 1GB of ram and 16GB internal storage. Then here’s the fun part, we have a 4.7″ 1280 x 720p AMOLED HD Display (like the Galaxy Note), 4G LTE, and the powerful 8 MP camera on the rear and 2 MP up front that we are accustomed to from the Galaxy S II smartphone. 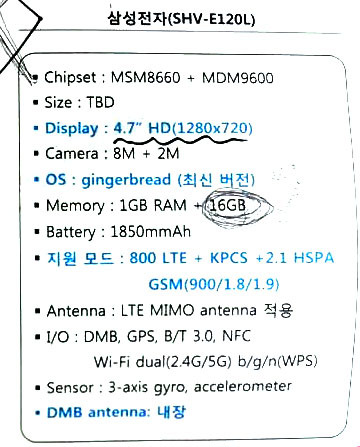 With a huge 1850 mAh battery and the latest Android 2.3 Gingerbread this sounds like a beast. My first thought is whether 4.7″ is too large for most, although the Galaxy Note linked to above received plenty of praise when it was announced so maybe 4.7″ is just another large screened awesome smartphone many will want. I know the image above doesn’t tell much, or give us any idea where these details came from but for now you can peg me as excited.